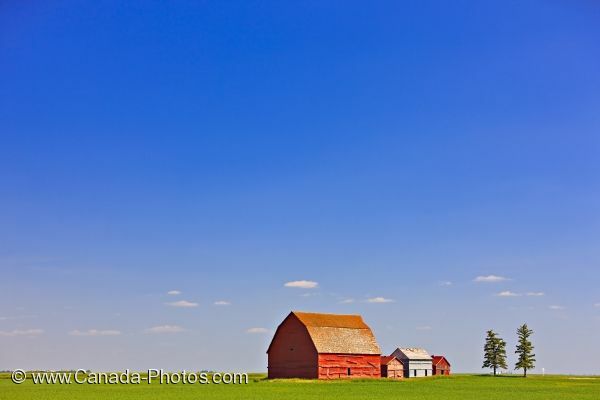 A large barn and three smaller barns sit in the middle of a large field in the prairie of southern Saskatchewan, Canada. In the prairie land of southern Saskatchewan are open fields of farmland. The farmland has a large red barn and three smaller barns next to each other. Two evergreen trees stand by the barns. Small puffs of clouds hang low in the blue horizon. Red barns sit in the middle of a large open field in the prairie in southern Saskatchewan, Canada.